- Call (410) 651-3611 NOW to order at these low prices! The Moeller easy Multi Function Display (MFD) combines the power and networking functions of the easy 800 professional intelligent relay with an attractive LCD graphical HMI operator display. 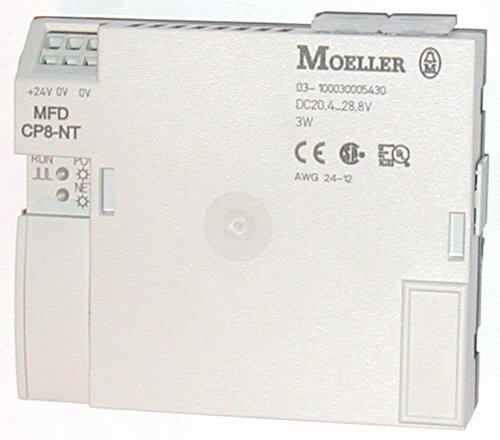 The Moeller MFD can operate on its own with integrated I/O, or as part of a system using easy relays. 300 digital and analog I/O to be controlled using a distributed architecture. Features of the MFD-Titan include 256 lines of control circuit, PID function, advanced math's, analog I/O, encoder input, direct temperature sensor connection and many other advanced functions. The HMI can show user graphics, trends, text and numeric information using the door-mounted, back-lit display. Operator interface is via nine fully programmable buttons and two bright LEDs. easySoft Pro, an intuitive Windows programming tool, is used to configure the MFD and easy 800 range. It includes hardware design, logic, graphics, simulation, networking, online monitoring in one low cost package. The easy MFD HMI-PLC will also appeal to original equipment manufacturers (OEM) as it can be ordered pre-branded with custom logos and function key inscriptions created using a free label editor. Hygienic front covers and a luxury gold anodized front frame are also available for MFD.